In an earlier blog post we applied multiple regression analysis to determine the optimal weighting of Alex Reisman’s six “March Midness” screeners in predicting stock prices over various time spans. 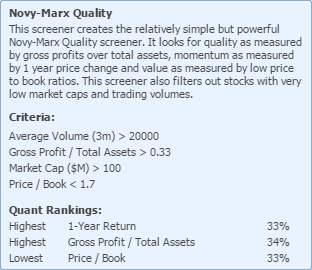 In this exercise we apply the same method to validating the Novy-Marx Quality and Value screener’s ability to predict the 5-year total return. The Novy-Marx approach attempts to integrate two somewhat related investment strategies; quality and value. Value strategies endeavor to discover inexpensive productive companies (i.e. undervalued assets) whereas quality strategies evaluate gross profitability by one means or another. This investing philosophy was succinctly summarized by Warren Buffett: “It is far better to buy a wonderful business at a fair price than to buy a fair business at a wonderful price” (Novy-Marx, R. 2014). Professor Novy-Marx’s research found that profitability, measured by gross profits-to-assets, has approximately the same power as book-to-market in predicting a cross section of average returns. Profitable firms generated significantly higher returns than unprofitable firms, despite having significantly more favorable valuation ratios. Controlling for profitability dramatically increased the performance of value strategies, especially among the largest and most liquid stocks. (Novy-Marx, 2013). The multiple regression analysis was applied to about 250 stocks in various sectors, and overall, the screener produced a significant positive multiple variate correlation (R= 0.52, P<.001) with the 5-year total return. However, the 1-year total return alone gave correlation of 0.49 demonstrating that it was by far the best predictor of the 3 parameters. Of course the 1-year return is a direct contributor to the 5-year total return so it is not as informative as it would have been if this predictor had been totally independent of the dependant variable. Nevertheless, it suggests that past success is a very good, but not perfect, indicator of future performance. Contrary to expectation, the price to book ratio contributed very little either positively or negatively and the gross profit / total assets ratio making a small but significant contribution. 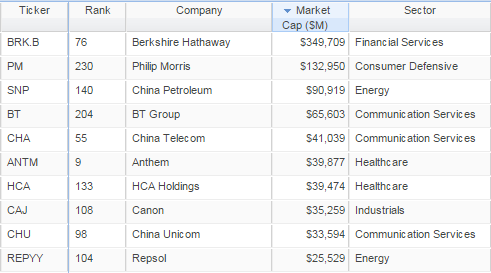 Of course the dataset included only 250 stocks with a market capitalization of more than $100 million and average daily trading volume of more than 20,000 shares limiting the generality of the results. Despite this limitation, the results suggest that the 1-year total return or growth is the most significant single parameter of both the Novy-Marx screener and Alex Reisman’s March Midness growth analysis in predicting the 5-year total return. Novy-Marx R., (2013), The other side of value: The gross profitability premium, Journal of Financial Economics, 108, Pages 1–28. Novy-Marx, R. (2014), Quality Investing,’ Working Paper’, University of Rochester. Allan Smith is a retired neuroscientist and now an enthusiastic, but unofficial, member of Stock Rover’s beagle pack of stock-hunters. Please send comments to feedback@stockrover.com.